However, the Gionee A1 was unveiled in the month of February, while the camon cx was unveiled in the month of March. So they are still very new smartphones. Tecno Camon Cx is currently making waves in Nigeria, that's not the case with the A1, as gionee is yet to launch the smartphone here in the Nigerian market. We have seen many people in some trending searching for tecno camon cx vs gionee A1, which is better? Which should i go for? The answer is about to be unfolded right now. We are very sure that after going through the table above, you should have basic knowledge about the two smartphones which is the Tecno Camon Cx and Gionee A1. 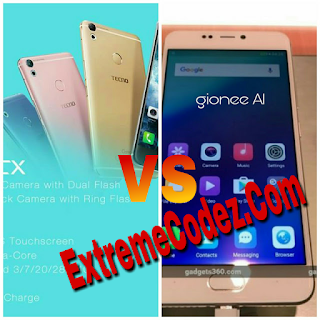 Meanwhile, the Gionee A1 is a better phone compared to the Camon Cx, but the fact is that you will have to pay more to get your hands on the device. Because the both smartphones worth it and the amount is huge. You can use the comment box to quickly drop your own view on the both phones. Gionee a1 is better 4 me but the price too high I can't use my money to buy such.